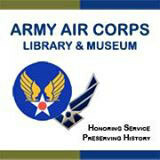 The Army Air Corps Library and Museum mission is to preserve and present the history of the Army Air Service, Army Air Corps, Army Air Forces and US Air Force. Through artifacts we are able to tell the story of the servicemen and women who have served. Enjoy looking at and reading about the men, aircraft and all aspects of their service during war and peacetime as you view our website or attend one of our exhibits.